If you are a new learner, our friendly team will help you take that all important first step back into learning. If you are a returning learner, we can offer you information and advice on how you can progress further in College or help you find out about other wider opportunities in the area. 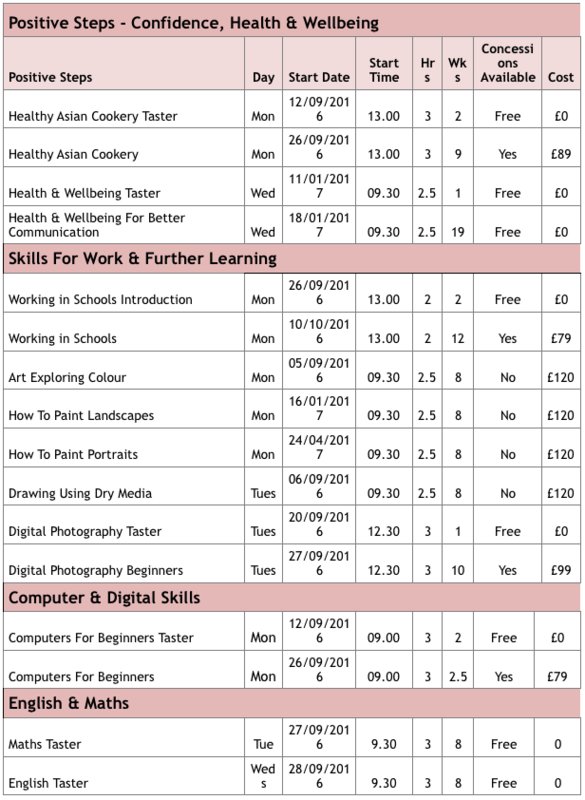 To book a course at Westhoughton Community Learning Centre call in to enrol. Our enrolment times may vary so please call to check times or visit the college website. You can also email westhoughton@boltoncc.ac.uk or ring 01204 482980 or 01204 482920. On some of the courses you may be entitled to a further concession (Conc – free or reduced fee) depending on your circumstances (e.g. age, benefits received, or gaps in qualifications obtained). For further information on concessions and what evidence you need to provide, see www.boltoncollege.ac.uk/fees or contact your nearest Centre. The taster courses will give you a chance to try out the course. If you have been resident in the UK for less than 3 years, you will need to bring your Home Office documents with you to enrolment, confirming that you have indefinite leave to remain. If you are unable to provide the documents, you may be asked to pay for your course. Please speak to a member of staff before you enrol. Please note that course times and dates can be subject to change.